For my event project, I explored a few possibilities for underwater 3d capture. After briefly considering sonar, structured light, and underwater photogrammetry a try, I settled on using Scatter’s DepthKit software. DepthKit is a piece of software built in OpenFrameworks which allows a depth sensor such as a Kinect (I used the Kinect V2, an infrared “time of flight” sensor) and a standard RGB digital camera (I used the Kinect’s internal camera) to be combined into a “RGBD” video- that is, a video that contains depth as well as color information. Along the way, I encountered a few complications with this project. Chiefly, these were due to the properties of water itself. I would obviously need a watertight box to house the Kinect. After much research into optics, I found that near-visible IR around 920NM, the frequency the Kinect uses, is greatly attenuated in water. This means that a lot of the signal the Kinect sends out would simply be absorbed and diffused, and not return back to the sensor in the manner expected. 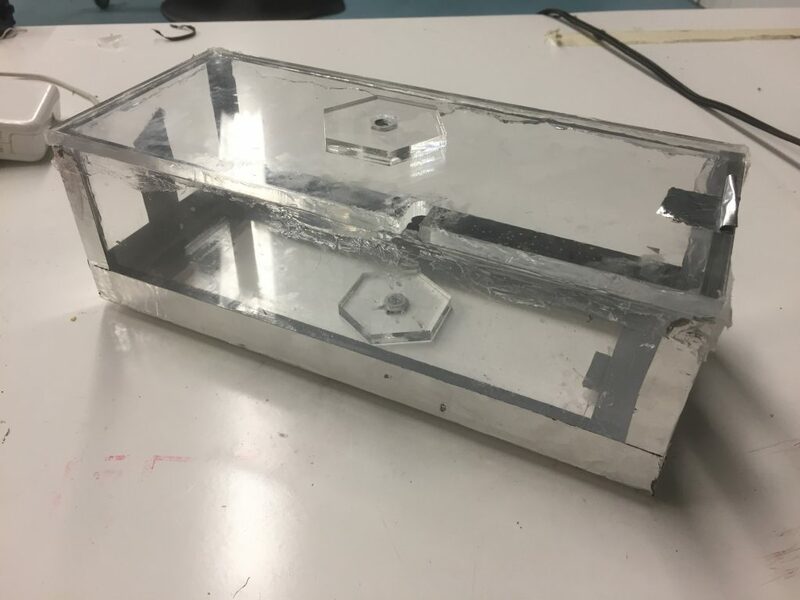 With the challenges of underwater optics in mind, I proceeded to construct an IR transparent watertight housing from 1/4in cast acrylic. This material has exceptional transparency, and neither reflected nor attenuated the IR signal or color camera feed. I also attached 1/4-20 threaded bolt to the exterior of the box, to make it magic arm compatible. 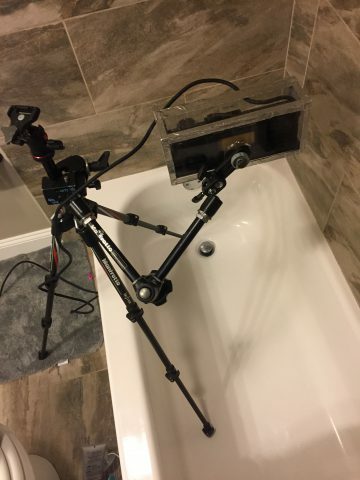 I carried out initial testing right in my bathtub. 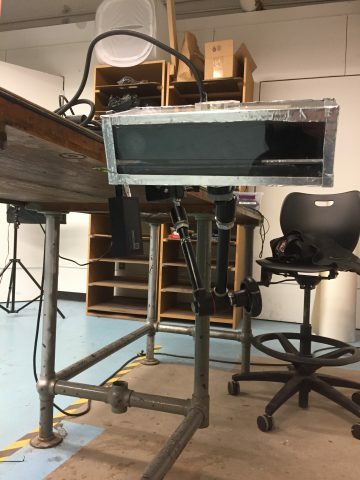 Here, I tested three scenarios: Kinect over water capturing the surface of the water; Kinect over water trying to capture detail beneath the water; Kinect underwater capturing a scene under the water. 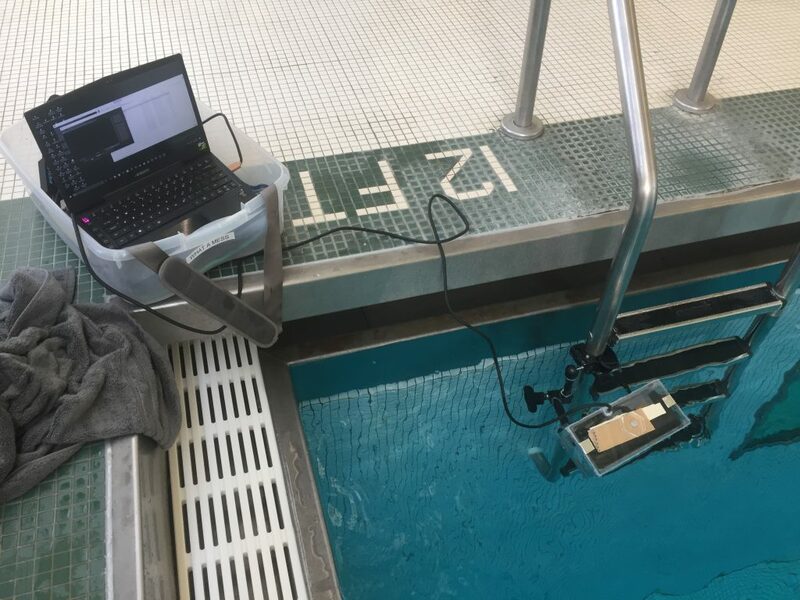 It was immediately pretty clear that I would be unable to penetrate the surface of the water if I wanted to capture depth information below the water; I definitely needed to submerge the Kinect. And to my surprise, when I first placed my housing under, it (sort of) worked! The IR was indeed absorbed to a large degree, and the area in which I was able to capture both video and depth data together proved to be very small. But even so, a RGBD capture emerged. The CMU pool is available for project testing by special appointment, so I took the plunge! The results I achieved were basically what I expected- the captures are more low-relief than full RGBD, and the depth data itself is quite noisy. I also discovered that the difference in refraction of light throws the calibration of the depth and RGB images way out of whack- manual recalibration was necessary, and even then it was difficult to sync. That said, I did have some great discoveries at this stage. Bubbles are visible! I was able to capture air exiting my mouth, as well as bubbles created by me splashing around. This is a highly well-researched, well-executed, well-explained project. The aesthetics are terrific. However, I wish the results were more conceptually cohesive than just “Yep, here’s me, swimming underwater”. In my opinion, the most compelling story would be if you said something like, “So, I wanted to CAPTURE A BUBBLE.” Even if doing so involved a bit of backforming the story of your project, a sharp focus on a magical goal like that would transport this from a great study to a incredible one.